There's a beautiful reservoir between Eureka and Libby, Montana. Highway 37 follows it for 40 of the 65 miles between Eureka and Libby. The reservoir is called Lake Koocanusa, and it was formed by damming the Kootenai River, which was central in the development of Libby. It's beautiful and sparsely populated. In fact, my trip to Libby and back to Eureka (more on that in a moment) was extraordinarily peaceful. Cars come by at the rate of 1 or 2 every ten to fifteen minutes. Although challengingly hilly, I really enjoyed this ride. Beyond the reservoir lies the river, and it's pastoral beauty makes the ride into Libby a genuine pleasure. The Kootenai River about 5 miles north of Libby. I knew as I approached Libby I would have to make some decisions. Now that I am able to gauge the challenge of biking in this environment, I was going to be able to make some calculations about the timing of my arrival into Seattle and my trip down to Portland, where I will leave my bike (in a friend's basement) for more cycling in the Pacific Northwest later in the summer. I hadn't been too worried about distances and time when I started the trip. 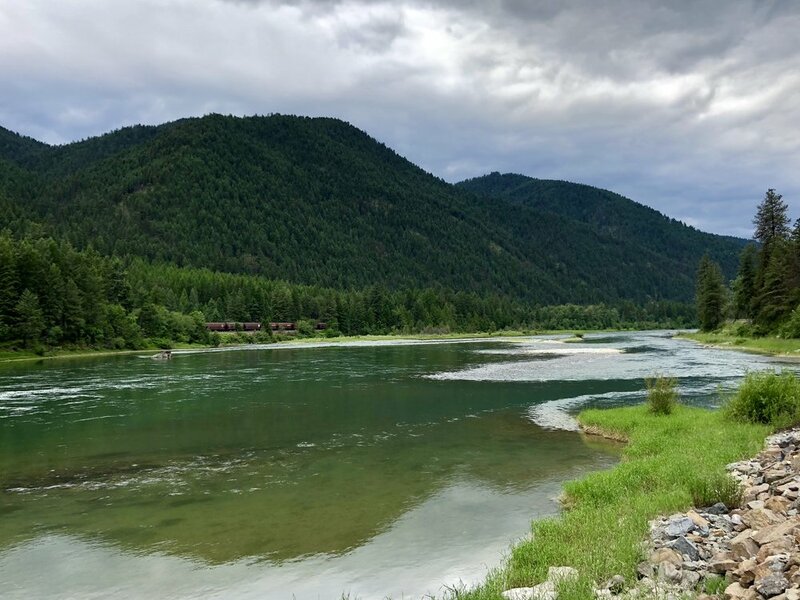 In the back of my mind I knew the Adventure Cycling Association (ACÁ) route called "Northern Tier" followed the Amtrak "Empire Builder" route (this route has walk on bicycle service) from East Glacier to Sandpoint, Idaho. So I thought I could board the train at any point up to Sandpoint should I run short of time. I started to think about this in Libby, with the thought that I might use the train once I got to Sandpoint. But as I looked into it, I learned that many of the smaller towns have no staff, and consequently no way to put a bike in the baggage car designated for bikes. So although the Amtrak website suggests otherwise, it's not possible to get on the train at certain stations with a bike. Both Libby, Montana and Sandpoint, Idaho, have this limitation. But alas, I had already made plans to see friends in Seattle and Portland, and even booked a non-refundable flight back from Portland to New York (far earlier than I could ever get there by cycling). What to do? Then it struck me. I could ride back to Whitefish (two days east), and still catch a train west to Seattle where I could board my bike. So I did. In fact, I'm writing this blog post in the Whitefish train station while I wait for the train. Forward or backward, life has a way of working out. If you care to see my past three days of redundant rides on Garmin Connect, look here, here and here. On my return trip From Libby to Eureka, I came across a Washingtonian named Blaine who was driving this extraordinary 1961 Thunderbird. How cool is that? As much as I enjoyed Blaine and found him an intelligent and informed guy, I couldn't help but reflect on the gas milage of his vintage Thunderbird. He told me with some pride that he got 8 miles to the gallon. How interesting that a car that symbolizes a simpler age when freedom was a much simpler construct could still seem so comforting. I can indeed remember when gas cost 19 cents a gallon. At that price, and at a time when we'd never heard about climate change, why not? Whatever it is about Blaine's car that made me feel good is similar to why I like RV parks, and why American kitch delights me far more than it irritates. It's represents a time we long for, a time that's gone, a nostalgia for a much simpler, less complicated world. So, I spent much of my backtrack to Whitefish thinking about the mess we are in with our changing climate. I almost never meet a person who agrees with the science who feels like they can make more than a superficial difference. And, at the individual level, that is probably the case, unless one is wealthy enough to do what many corporations do, and offset the carbon that results from activities they cannot mitigate by purchasing carbon offsets (a viable and underused option that will probably increase over time.) But for "regular" folk - we're just stuck in a way of life that isn't of our making but still offers us some joy. Blaine believes in climate change, by the way. And he also loves his Thunderbird. And why shouldn't he? So if it's not Blaine's job to change things by selling a gas guzzler he loves, then who's job is it? We all could use some help living in ways that are less harmful to our climate. More and more, I think that our best way out of the mess we are in is through market based adjustments on the price of carbon. For generations we have allowed fossil fuel companies to pollute our atmosphere without having to factor the external costs of that pollution into their profit margin. So instead, the rest of us are paying that cost for them through degradations in our weather, health, economic well being, and social stability. And without meaningful intervention these trends will only accelerate. It's time to put a price on carbon. There are many good groups working on these problems. My favorite is this one. From the New Yorker, late June, 2018.